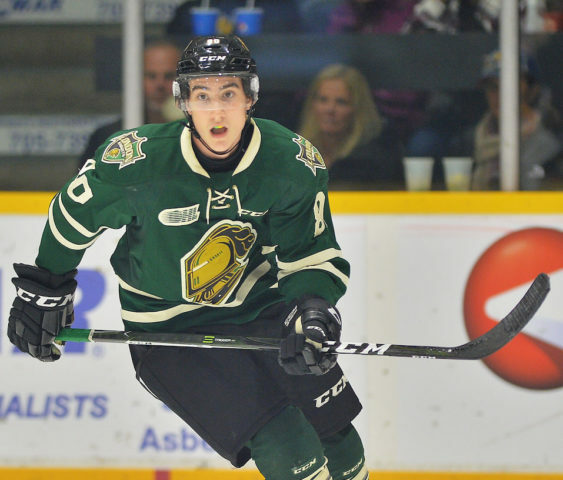 Knights Playing Underdog to Owen Sound’s Attack? When the OHL’s Trade Deadline came and went, questions surrounded the short-term future of the London Knights. What were their plans? Where were they going after trading away their biggest assets? Instead of crumbling without their big four, the Knights turned the heat up in the Western Conference and became one of the tougher teams to play against down the stretch. NHL Draft prospect Evan Bouchard stepped up in a big way, while Ottawa Senators’ prospect Alex Formenton found a way to lead the team as one of its veterans. Now, falling just shy of fourth spot in the conference and home-ice advantage, the Knights will have to take on one of just four of the 100-point players this season in Owen Sound’s forward Nick Suzuki. While the Knights will rely on guys like Bouchard, Formenton and the recently unleashed Liam Foudy, the Attack will count on Suzuki, Maksim Sushko and Aidan Dudas to lead them into the second round. The Knights and Attack met six times during the 2017-18 regular season, with the Knights coming out on top. While the Knights tallied a record of 4-1-1 over the six meetings this season, it didn’t matter whether they were at home (2-0-1) or on the road (2-1-0) when it came to playing the Attack. The Knights outscored the Attack 22-16 and won 55.2% of the draws through six games. But while London carried the advantage in those two categories, the Attack came out on top on three other major categories. They out-shot the Knights 201-155 (an average of 33.5 to 25.8 per game) and were better on both the power play and penalty kill. Special teams will be a major role player in this series and during the season, it was the Attack that showed their dominance on both. In their six games, the Attack’s power play clicked at a rate of 17.7% while the Knights only operated at a 9.1% rate. As for the penalty kill, the Knights were 82.4% efficient with the Attack’s PK working 90.9% of the time. Still, the Knights came away with a better record. While the Attack are the better offensive team, at least on a numbers basis, the Knights have been better on the defensive end. This will surely be a battle worth watching in the OHL’s first round. While the Knights held the upper hand in the regular season, they will enter the first round of the playoffs as slight underdogs. They’ve given up home ice to the Attack and will start the series in Owen Sound, but don’t expect that to affect the Knights a whole lot. The Knights were 21-12-0-1 on the road this season with a point percentage of 0.632, while the Attack were 21-8-0-5 at home this season. Something will have to give as both teams look to catch the early advantage in this series. If the Knights hope to take the advantage, they will need to count on some of their young talent to help them take control of the game. After all, they don’t have the likes of Robert Thomas anymore who tallied six points in three games as a Knight against the Attack this season. But with guys like Thomas and Sam Miletic gone, here are the remaining top five scorers for the Knights against Owen Sound during the regular season. As for the Knights’ current goaltenders, here’s how they stacked up against Owen Sound in the regular season. In obvious fashion, the Attack were led by Suzuki against the Knights this season. 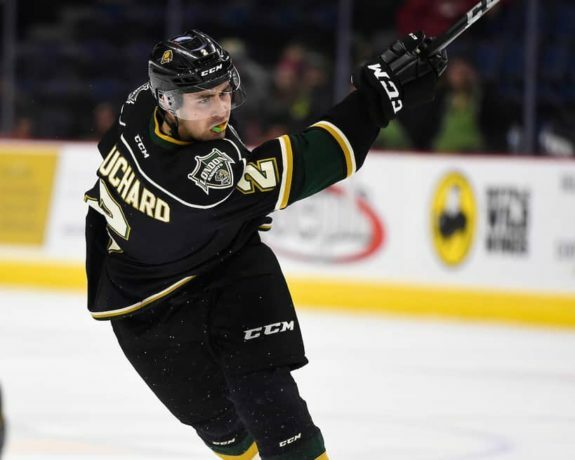 In fact, the Knights had a tough time stopping the fourth-highest scorer in the OHL this season with him tallying six goals in six games against London. Still, he’s not the only weapon the Attack have going for them and the Knights will have to watch as the depth on this Attack team is underrated at times. That said, Suzuki tallied 100 points this season and the Knights will have to find an answer to shut down the Vegas Golden Knights’ prospect. With that, here’s a look at the top five scorers against the Knights this season. And as for their goaltenders, here’s how they matched up against London this season. With both teams seemingly filled with offence, this series could come down to defence and goaltending with Raaymakers being the difference maker for the Knights. Game #1: Thurs., Mar. 22 at Owen Sound – 7:00 p.m.
Game #2: Sat., Mar. 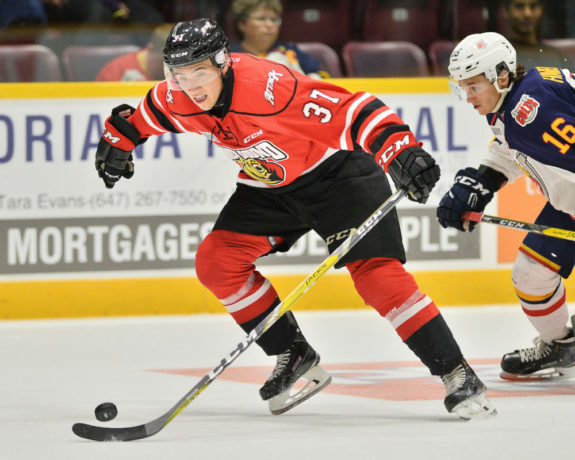 24 at Owen Sound – 7:30 p.m.
Game #3: Mon., Mar. 26 at London – 7:00 p.m.
Game #4: Thurs., Mar. 29 at London – 7:00 p.m.